Accel Partners. “Evaluating a Venture Capital Firm to Meet Your Company’s Needs.” 2009. Amis, David and Howard H. Stevenson. Winning Angels: The 7 Fundamentals of Early Stage Investing. Upper Saddle River, NJ: Financial Times/Prentice-Hall, Inc. 2001. Banatao, Dado P. and Kevin Fong. “The Valley of Deals: How Venture Capital Helped Shaped the Region.” In The Silicon Valley Edge: A Habitat for Innovation and Entrepreneurship, edited by Chong-Moon Lee, William F. Miller, Marguerite Gong Hancock and Henry S. Rowen, 295-313. Stanford, CA: Stanford University Press, 2000. Bartlett, Joseph W. Venture Capital Buyouts, Restructurings and Reorganizations, Second Edition. New York: John Wiley & Sons, 1995. 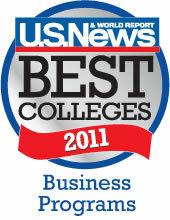 Barry, Christopher B., Chris Muscarella, John W. Peavy III, and Michael R. Vetsuypens. “The Role of Venture Capital in the Creation of Public Companies: Evidence from the Going Public Process.” Journal of Financial Economics, vol. 27 (1990): 447-472. Bates, Timothy. “Financing Small Business Creation: The Case of Chinese and Korean Immigrant Entrepreneurs.” Journal of Business Venturing, vol. 12, no. 2 (1997): 109-124. Benjamin, Gerald, and E. Sandles. “Angel Investors: Culling the Waters for Private Equity.” Journal of Private Equity (Spring 1998). Bhidé, Amar. “How Entrepreneurs Craft Strategies That Work.” Harvard Business Review (March-April 1994). Bhidé, Amar. “The Questions Every Entrepreneur Must Answer.” Harvard Business Review (November-December 1996). Brophy, David J. “Financing the Growth of Entrepreneurial Firms.” In Entrepreneurship 2000, edited by Donald L. Sexton and Raymond W. Smilor, 5-27. Chicago: Upstart Publishing, 1997. Edmiston, Kelly. “The Role of Small and Large Businesses in Economic Development.” Economic Review (Federal Reserve of Kansas City), Second Quarter 2007. Ehrlich, S.A. and A.F. De Noble, T. Moore, and R.R. Weaver. “After the Cash Arrives: A Comparative Study of Venture Capital and Private Investor Involvement in Entrepreneurial Firms.” Journal of Business Venturing, vol. 9, no. 1 (1994): 67-82. Field, Drew. Direct Public Offerings: The New Method for Taking Your Company Public. Naperville, IL: Sourcebooks Publishing, 1997. Fiet, J.O. “Risk Avoidance Strategies in Venture Capital Markets.” Journal of Management Studies, vol. 32, no. 4 (1995): 551-574. Florida, Richard L., and Martin Kenney. “Venture Capital and High-Technology Entrepreneurship.” Journal of Business Venturing, vol. 3 (1987): 301-319. Fried, Vance H. and Robert D. Hisrich, “The Venture Capitalist: A Relationship Investor.” California Management Review (Winter 1995): 101-113. Fried, Vance H., Garry D. Burton, and Robert D. Hisrich. “Strategy and the Board of Directors in Venture Capital-Backed Firms.” Journal of Business Venturing, vol. 13, no. 6, (1998): 493-503. Gaston, R.J. Finding Private Venture Capital for Your Firm. New York: John Wiley & Sons, 1989. Gladstone, David. Venture Capital Investing: The Complete Handbook for Investing in Small Private Businesses for Outstanding Profits. New York: Prentice-Hall, 1987. Gompers, Paul A. The Venture Capital Cycle. Cambridge, MA: MIT Press, 1999. Gompers, Paul A. “Optimal Investment, Monitoring, and the Staging of Capital.” Journal of Finance (December 1995): 1461-1489. Gompers, Paul A. and Josh Lerner. The Money of Invention: How Venture Capital Creates New Wealth. Boston: Harvard Business School Press, 2001. Gompers, Paul A. and Josh Lerner. “What Drives Venture Capital Fundraising?” Brookings Papers on Economic Activity: Microeconomics, vol. 2 (1998): 149-192. Grinstead, Mary Jane. “Ask an Angel: Berkus on Building a Board of Directors.” Angel Capital Education Foundation, July 8, 2008. Gupta, Udayan. Done Deals: Venture Capitalists Tell Their Stories. Boston: Harvard Business School Press, 2000. Hertenstein, Julie H. and Sharon M. McKinnon. “Solving the Puzzle of the Cash Flow Statement.” Business Horizons (January-February 1997): 69-76. Hisrich, Robert D. and Vance H. Fried. “The Role of the Venture Capitalist in the Management of Entrepreneurial Enterprises.” Journal of International Business and Entrepreneurship (June 1992): 75-106. Hohn, H.G. “Solving the Board Puzzle: How to Select the Right Directors.” Chief Executive (June 1996): 58-62. Hutchinson, Robert W. “The Capital Structure and Investment Decisions of the Small Owner-Managed Firm: Some Exploratory Issues.” Small Business Economics, vol. 7, (1995): 231-239. Johnson, Craig W. “Advising the New Economy: The Role of Lawyers.” in The Silicon Valley Edge: A Habitat for Innovation and Entrepreneurship, edited by Chong-Moon Lee, William F. Miller, Marguerite Gong Hancock and Henry S. Rowen, 325-341. Stanford, CA: Stanford University Press, 2000. Kawasaki, Guy. “Let the Hard Times Roll! Why Too Much Capital Can Kill You.” Journal of Private Equity (Summer 1999): 70-71. Kenny, Thomas J. “Closely-Held Corporation Valuation: Determining a Proper Discount Rate.” Business Valuation Review (March 1992): 22-30. Knight Ray A. and Lee G. Knight. “Three Key Methods for Valuing Profitable Closely Held Companies.” Journal of Corporate Accounting & Finance (Autumn 1993): 79-94. Kvamme, E. Floyd. “Life in Silicon Valley: A First-Hand View of the Region’s Growth.” In The Silicon Valley Edge: A Habitat for Innovation and Entrepreneurship, edited by Chong-Moon Lee, William F. Miller, Marguerite Gong Hancock and Henry S. Rowen, 59-80. Stanford, CA: Stanford University Press, 2000. Lacy, Sarah. “Sand Hill: VCs’ Long and Winding Road.” Silicon Valley/San Jose Business Journal Online (July 2, 2001). Lerner, Joshua. “Angel Financing and Public Policy: An Overview.” Journal of Banking and Finance, vol. 22 (1998): 773-83. Lerner, Joshua. “Venture Capitalists and the Oversight of Private Firms.” Journal of Finance, no. 50 (March 1995): 301-318. Link, William J. “Pursuing Venture Capital.” Kauffman Center for Entrepreneurial Leadership, July 26, 2003. Lippitt Jeffrey W. and Nicholas J. Mastracchio, Jr. “Valuing Small Businesses: Discounted Cash Flow, Earnings Capitalization, and the Cost of Replacing Capital Assets.” Journal of Small Business Management (July 1993): 52-61. Lister, Kate and Tom Harnish. Finding Money: The Small Business Guide to Financing. New York: John Wiley & Sons, 1995. Malkiel, Burton G. and William J. Baumol. “Stock Options Keep the Economy Afloat.” The Wall Street Journal Online (April 4, 2002). Mason, Heidi and Tim Rohner. The Venture Imperative: A New Model for Corporate Innovation. Boston: Harvard Business School Press, 2002. Meadows, Patrick. “From Angels to VC Firms: Floyd Kvamme and the Past, Present and Future of Silicon Valley.” Upside (October 2000): 118-123. Merrill, R.E. and G.E. Nichols. Raising Money: Venture Funding and How to Get It. New York: AMACOM Books, 1990. Moore, Stephen. “The World Discovers the Laffer Curve.” 2009 Index of Economic Freedom, January 2009. Miller, Merton H., and Franco Modigliani. “Dividend Policy, Growth, and the Valuation of Shares.” Journal of Business (October 1961): 411-433. Payne, William H. “Choosing Your Exit Strategy.” Kauffman Center for Entrepreneurial Leadership, 2001. Petty, J. William. “Harvesting Firm Value: Process and Results.” In Entrepreneurship 2000, edited by Donald L. Sexton and Raymond W. Smilor, 5-27. Chicago: Upstart Publishing, 1997. Price, Robert W. Roadmap To Entrepreneurial Success: Powerful Strategies for Building a High-Profit Business, New York: AMACOM Books, American Management Association, 2004. Reichert, William M. “Writing a Compelling Executive Summary.” Garage Technology Ventures, 2007. Reichert, William M. “Perfecting Your Pitch.” Garage Technology Ventures, 2006. Rosenblum, Peter M. “Writing and Negotiating Term Sheets with a View toward Success.” Angel Capital Education Foundation, February 18, 2008. Sahlman, William A. “How to Write a Great Business Plan.” Harvard Business Review, (July-August 1997). Schramm, Carl J. “Building Entrepreneurial Economies.” Foreign Affairs, July/August 2004. Shepherd, Dean A. “Venture Capitalists’ Assessment of New Venture Survival.” Management Science (May 1999): 621-632. Sudek, Richard. “Angel Investment Criteria.” Journal of Small Business Strategy, Fall/Winter 2006/2007. Venture Impact. 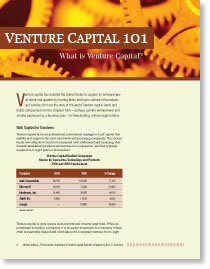 “Venture Capital 101: What Is Venture Capital?” National Venture Capital Association, 2007. Wetzel, William. “The Informal Venture Capital Market.” Journal of Business Venturing, vol. 2, (1987): 299-314. Wright, Mike and Ken Robbie. “Venture Capital and Private Equity: A Review and Synthesis.” Journal of Business Finance & Accounting, vol. 25, no. 5-6 (1998): 521-570.